Your outdoor space should be your own little slice of heaven. But of course everyone has a different definition of what that means to them. For some it’s all about having a space that’s a bit more on the fantastical side. So here are some of the top options you can add to your yard to make it instantly more whimsical. Easily the most famous and one of popular choices are garden gnomes. However, just because these little statues are considered a classic option that doesn’t mean they are boring. In fact it’s quite the opposite. They actually are available in a seemingly endless range of poses from the totally innocent to extremely naughty. And of course that means in a variety of different themes as well to make sure they match your space, interests, and taste. 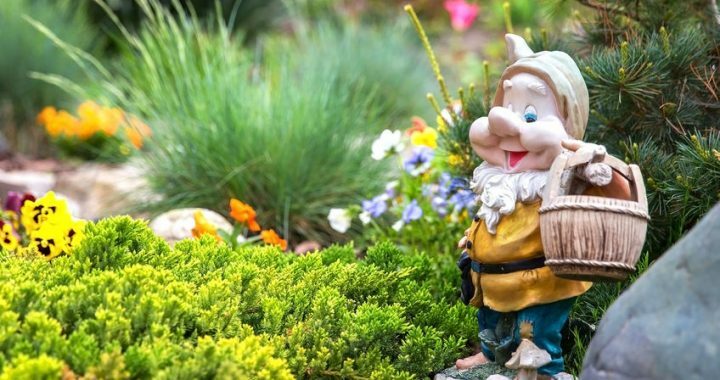 It’s no wonder so many people start with one or two gnomes in their garden and end up with an ever-expanding collection all around their property. For many people one of the most enjoyable ways to add bit of fantasy to their outdoor space is by creating a fairy garden. By strategically planting living flowers and plants in a pot you can make a miniature landscape that’s the ideal space for fairies. And then of course you’ll want to add fairy figurines along with tiny features such as a house for them to live in. These are often sold as kits and many backyard gardeners quickly find themselves enjoying the process so much that it becomes one of their hobbies. Like many living creatures, trees are believed by a lot of cultures and individuals around the world to have a spirit. Whether you believe this or not, you can still have fun with the idea by giving them their very own tree face. Of course you may want to do this with just one or multiple trees. Fortunately faces come in many different types and styles from animals to much more whimsical tree faces depending on what you prefer. A few are even scary in appearance. Faces are often made to fit around the body of the tree or to be placed in a hollow section making them appear quite natural. Some of the most fun options are statues made in the form of fantasy style creatures. From dragons to gargoyles and unicorns there are plenty of unique and even hilarious ways to go. So it’s not hard to find your favorite creatures from movies, stories, and legends. For instance Bigfoot garden statues have become increasingly popular in recent years. While some are more reasonably sized, life-size statues can be as tall as seven or eight feet and therefore are capable of making a giant impact. When made from a material like resin they can also be highly realistic. For a more artistic looking backyard monster a wooden Bigfoot statue will likely be hand-carved and therefore have the artist’s personal touch. Adding a bit of fantasy to your outdoor space is always fun. And whether you decide to use one, some, or all of these options you’re sure to make it not only more whimsical but totally unique as well. Posted in Landscaping and tagged ideas, whimsical, yard.